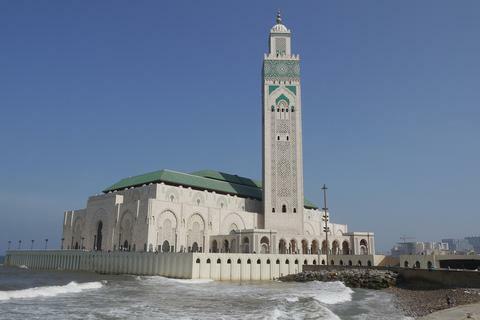 The Hassan II mosque in Casablanca, built by the will of the sovereign Hassan II and inaugurated in 1993, is the largest mosque in Morocco and in size the third mosque in the world (after the Masjid al-Haramdella Mecca and the mosque of the Prophet of Medina ). Designed by the French architect Michel Pinseau and built by Bouygues, it stands on a tongue of land facing the Atlantic and can hold 25,000 faithful; another 80,000 people can be accommodated in the courtyard. On the top of the mosque minaret, the highest in the world with its 210 meters, is mounted a lighthouse with a laser pointing towards Mecca.